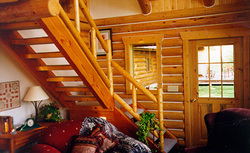 Cabin on the Yellowstone is a beautiful guest cabin located on the Yellowstone River. The views of the river, as well as the Absaroka Mountain Range are spectacular. The cabin includes a stocked kitchen, refrigerator, Jenn-Air, tub-shower jacuzzi, washer and dryer, loft with a queen and twin bed, sleeper couch, Satellite TV and gorgeous views. The cabin may be rented during any month of the year. Off Season: October 15th - May 15th $140.00 per night double occupancy, $20 each additional occupant. Maximum of four people. MAJOR CREDIT CARDS:.Visa, Master Card, American Express, Discover. *7% bed tax not included. RESERVATIONS/CANCELLATIONS:.A deposit of 50% of your stay will guarantee your reservation. Deposits will be refunded on thirty days notice. SMOKING:.This is a smoke free environment. Directions: Cabin on the Yellowstone can be reached from Gallatin Field Airport in Bozeman by taking Interstate 90 east to Livingston. Take second Exit off Interstate 90 and head south of Livingston on Highway 89. South of Livingston, cross river at either Carters Bridge or Pine Creek Bridge to East River Road 540. Continue south on Road 540. Turn on Loch Leven Fishing Access Road; stay on main road to fire #83.